A bit delayed, since I spent a goodly portion of Saturday running, and most of the entire weekend without internet. With the small fields it can be a little tough to interpret results from these events, to be sure. Particularly when the distance race was a pursuit, which often lead to artificially low FIS points for many of the leaders. And of course in sprinting, we don’t really have any way of measuring the strength of the field beyond the qualification round. 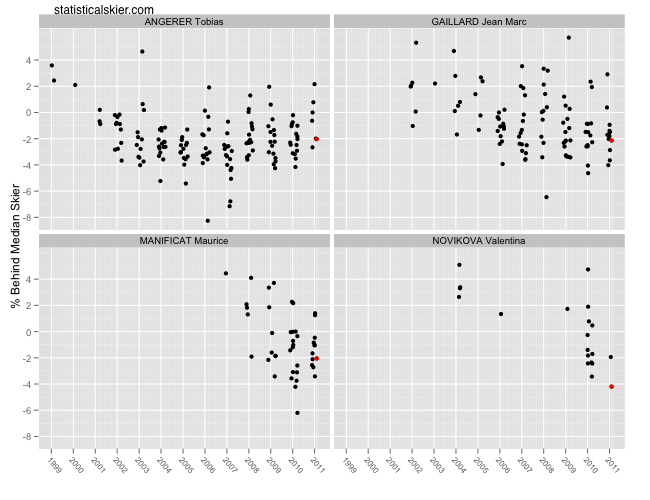 I’m using the percent behind the median skier, and I’ve only plotted major international races (WC, OWG, WSC, TDS). The red is obviously the Rybinsk result. For the three men, this makes their results look somewhat less impressive. Not bad, of course, but probably not quite as good as they might have seemed from just glancing at the results. Valentina Novikova is a rather different case, being a somewhat less seasoned racers than the others. She hasn’t had the opportunity to do many distance World Cups this season, but her strong result in Rybinsk does actually seem fairly good compared to her results last year. The message here is mostly the same, I’d say. 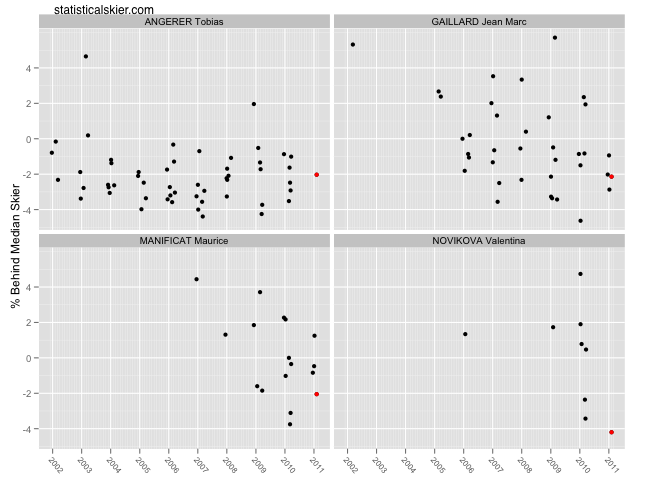 Manificat’s race looks perhaps somewhat stronger, particularly compared to just this season, but everyone else looks about the same as before. Posted by Joran on Tuesday, February 8, 2011, at 6:00 am. Filed under Uncategorized. Tagged Distance, men, pursuit, recap, rybinsk, women, World Cup. Follow any responses to this post with its comments RSS feed. You can post a comment or trackback from your blog.